My old man nearly didn’t make the match yesterday. His dog, Victoria suddenly died on Saturday. She just walked into the kitchen where he was preparing dinner, gave a last whimper, keeled over and exhaled her last breath. Only an hour earlier, she had been out for a walk bouncing around with her usual enthusiasm. It has been a sombre week as autumn takes full hold. The days becoming shorter, colder and more windy. Normally when visiting Manchester this time of year that feeling seems to exacerbate tenfold. My dad’s reminiscences of his student days spent in this city are pretty grey but at least he managed to see Chelsea play at Maine Rd. Thankfully, there was a football match to replace the general grimness that surrounded us. There was also another reason why we nearly did not make the game. After taking the Victoria line to the khazi that is Euston station, trains were delayed and/or cancelled as some moron had thrown a filing cabinet onto the tracks around Watford. We somehow made it just in time to catch the last train that goes directly to “Manchester FC” from Manchester Piccadilly to catch kick-off. Even having lost six stone, the seats in the away end are tighter than a Scotsman’s wallet and you are pretty much forced to stand or else your blood may stop circulating in the lower part of your body. The atmosphere from the away end was fantastic again. “We’re top of the league”, is a chant that keeps going round my head. The strange thing was that to some extent I empathise with their plight. The club has squandered tens of millions of pounds on average players and there is no control the fans can have such decision making. Our club lost a lot of goodwill amongst our fans with some of its decisions but was lucky to have brought Mourinho back when it did. This season has been a revelation but going into the match you did not feel that confident of a win with Costa missing. We still love you Drogs but thankfully we have a strong midfield to compensate for his lack of sharpness despite him scoring a typical striker’s goal. And if only we could have been more cynical. Hazard when through on goal could easily have tumbled and earned a Man U player a red card. (Ivanovic could have done the same later on during the second half and have earned us a penalty). Instead, he squandered a fantastic chance to open the scoring but was lucky that Drogba bailed him out with a brilliant header from the subsequent corner. There was one run in the first half from Eden that simply left me spellbound. He left the Man U players in his wake. You hope that as you mature you can watch football from a more sober perspective. It does not mean giving polite applause to the opposition should they score against you but at least acknowledging when your team has played brilliantly or poorly – or if the opposition has simply been better. Last season, Crystal Palace deserved to beat us at Selhurst for instance. They were excellent that day. But sometimes, you also have a fairly even match where you need the officials to do their duty to a professional standard. Yesterday was not one of those days. Even trying to be as balanced as possible, Dowd and his team’s decision making was utterly disgraceful. From the small – throw-ins going to the wrong side – to the large – free-kicks not given and even a penalty decision missed… but for some reason I am not too bitter and have taken everything in my stride. The confidence you have in this Chelsea side is huge. We have world class players to cover almost every position apart from up front – but then again, with a club that only likes to play with one striker it is a difficult situation to manage should you have two superb strikers and can only choose one for each game. We beat the queues as the final whistle went and jumped on the train back to Manchester Piccadilly… even managing to have a normal conversation with some returning Man U fans who agreed that their club was struggling. Then back to South-West London and home. Journey time 3 and a half hours from leaving the ground. You need days out like this. The loud and proud use of the word "ultras" by any team's fans usually makes me think of two things. Firstly, that the term is being used because their side must play such tedious football that they need continuous, nonstop nudging and reminding of their home support to sing in case they nod off. The reason for this is a flashback to Italian football during its heyday. After a club that starts with the letter, "L" caused English clubs to be banned from Europe because of the behaviour of their fans (it wasn't their fault, of course) other leagues thrived. The standard of skill and talent on display in Italy meant that we regularly watched Football Italia on Channel 4 in the 1990s. The word chalk and cheese when comparing leagues could not have been more aptly used. However, most derbies were like watching a game of chess and therefore fans needed to be proactive. Then one move would ignite your whole mind. A goal would be scored from the halfway line creating pandemonium on the terraces: flares would ignite; flags be waved; fans would try to climb over fencing to batter the opposition supporters whether they were winning or losing. But during that game you could have done your homework. Or gardening. Or washing up. And more often than not the goal would have been scored when you went to the bathroom having tried in vain to keep bladder discipline. 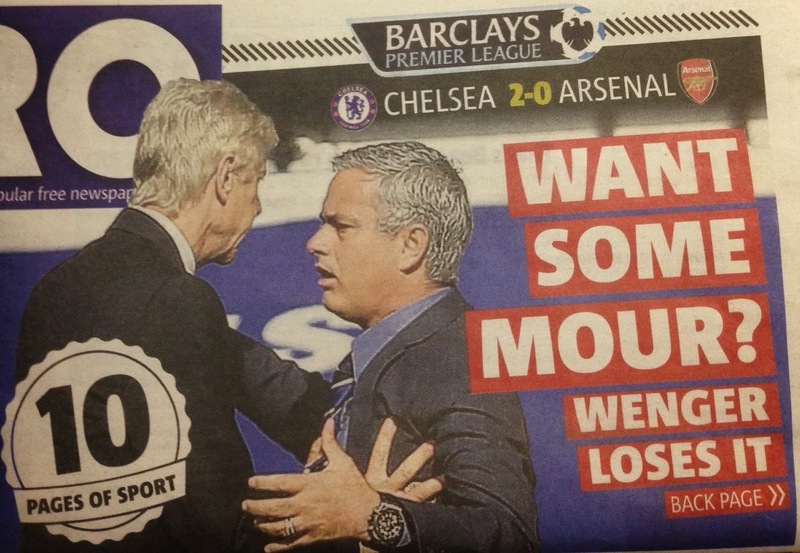 The second thing that springs to mind is a small club mentality. Why use a term that derives from the continent? You are a club in South-East London so at least form your own identity. In Europe you see fans who like to boast on banners displayed on their terraces how they are "ultra supporters" of their own side. Oh, really? Then why do you write how much you love your club in English if you are based in Germany? Haven't you got your own language? There are several things for sure. One is that the best way to ignite the away end at a football ground is to have home fans hold up banners pre-match (with stewards turning a blind eye) having a go at our owner's "dirty money" and declaring yourself "against modern football". Oh, really? So no issues with having betting businesses as partners of your club? And have such left-leaning support lovingly decorate local parking signs with their ultras stickers? In any case, well done... because if there is a way of ending up with egg on your face is then seeing your side concede a goal barely after kick-off. Neil Warnock is a man who for a while (believe it or not) I did not mind. I like a guy who says what he really feels and wears his heart on his sleeve. The only problem for me is when you do not practice what you preach or are ludicrously hypocritical to shift the focus away from your side's deserved loss. Because for Dave's deserved red card there were more than four Palace players surrounding the referee than there were Chelsea players after Delaney's second yellow (which really should have been his third). Before that incident occurred the home side were lucky to have escaped with only one booking with the cynical tackles that we have had to almost get used to. Most opposition sides find little other way to stop our swift midfield. That is on top of a couple of utterly woeful decisions where the referee could not tell the difference between a goal kick and a corner. No wonder Ivanovic was so incensed when a throw-in went against him which was clearly Chelsea's. But hey-ho... MotD has not got a set of balls to go through the minutiae of the match as a barrister would do in court to prove the stupidity of Warnock's comments. And how to add more egg on your face - Campbell givin' it large to Fabregas when the red card was produced only for later to witness Cesc score one of the best goals of the season. Hey Neil - at least there is one parallel with the Serie A matches we used to watch - the amount of rolls the home player made after John Terry's tackle in the first half in an attempt to have him booked. Unlucky. Almost every week we are now seeing this magnificent Chelsea side score what would have won goal of month for a whole season with barely a quarter of the campaign passed. Man U next week and if our fans can be as vociferous as we were yesterday then we can really count as being the twelfth man - with no drum needed. This Sunday could prove to be our biggest test this season. Now to start the left wing of the 'butterfly formation' plan to visit league stadia in Lisbon. It was the day after the victory against Sporting Club de Portugal where we should have won by a canter and it was time to properly show my colours. Chelsea logo'd t-shirt, blue shorts and even blue socks. Yes, I looked like a complete bender but also it was important to look as much of a tourist as possible when visiting my remaining four stadia. No Stone-Island jackets, Burberry scarves or Polo baseball caps worn here. The first stop was Atlético Clube de Portugal which as with many football clubs in the country is part of a larger sporting franchise. Based at the Estádio da Tapadinha, it also boasts a basketball and gymnastics team (among others) under its Atlético Clube de Portugal name. It plays in the Portuguese Liga de Honra (Liga Orangina) which is the equivalent of our Championship. A stadium in the middle of nowhere but with beautiful views of the Ponte 25 de Abril which resembles a mini Golden Gate Bridge with a huge statue of Jesus in the distance like the Christ The Redeemer Art Deco colossus in Rio. All the club's staff were in and accompanied by their pet dogs who seemed to stare at me in bafflement. I walked around the stadium having asked the groundsman's permission - no issues whatsoever. Again, it was the West Stand benches all round. The directors' area was probably not up to Roman's standard only boasting a few chairs, a power socket and a dustbin inside. One seemed to take the description quite literally and was just an empty box with a view onto the pitch. As I sat in one of the seats and peered out I noticed a young gent below me texting on his 'phone. Then more and more athletic looking chaps started to appear. It was then that I hoped that perhaps there would be a chance of me of catching a training session. Nope, in fact there was a match taking place a few hours later. I spoke to the club's doctor - a very lovely lady called Rita who was cognesccent of the fact we at Chelsea also have Eva as a female member of staff. She explained that the reason the players had appeared was not for training - but because there was an actual match taking place that afternoon. At 4pm. "Why at that time?" I asked. "Because we have no floodlights", was her seemingly embarrassed reply. A good answer... and this is a club that plays one division off the top flight! She kindly offered me a free ticket which I declined. For one thing, they only cost 4 Euros in any case and secondly with a flight at 8pm it would leave things tight for reaching the airport in time. A shame... but my visit to the stadium did not bring them any luck with the side losing 2-1 later that day to Oliveirense. It was a great experience to visit a friendly club that really felt part of the community with such fantastic views from its terraces that normally average 4,000 fans. The second ground to visit that day was one that plays in the top flight - C.F. Os Belenenses. It plays at the Estádio do Restelo which is not that far away from Atlético. This was where I had to be a bit sneaky as the ground was closed to visitors and its museum shut for lunch (as you do on the continent). It again boasts many other sporting activities including handball and rugby under the one club's name. It is a strange ground as three-quarters of it is new but one-quarter has been left bare. It appears to have been done so in order to leave a view of the Rio Tejo river for spectators should a match become tedious. Despite the newness of some of the stadium, it was lovely to see that it had still kept some of its old, quaint ticket booths. A huge memorial to a former player, José Manuel Soares lies next to the club's administrative offices. He died in 1931 at the age of 23 from food poisoning. It is a tradition that whenever FC Porto visits CF Belenenses for a match, the team always leaves a wreath in front of the statue before the game begins as his final ninety minutes on a football field took place for the national side in Porto. I sat at the ground's bistro/restaurant to have a lovely lunch and contemplate matters when yet again a dog that was part of the stadium workers' team came up and sniffed my leg. "That dogs bark at me as I halt by them". My blood has been boiling for much of the week. Aggressiveness has been at the forefront of my mind and the general tetchy mood began after the Sporting Lisbon game. It was hard to figure out why. Maybe us blokes also get some form of pmt? Maybe it was because of the change in the weather - one of those theories that one's grandma comes up with? Or perhaps it was something to do with work? No - the answer was simple. Somehow, subconsciously it appeared that this feeling was down to one thing - knowing that this fixture was coming up. The mind picks various moments in one's life to remember - I can vividly recall Dennis Wise hushing our away end that had been kept in after the game in Feyenoord all those years ago and starting a chorus of "Carefree". But for some reason the same cannot be said for performances of Salomon Kalou. Similarly, certain matches against today's opposition can be remembered and for more negative than positive reasons. The berating of the fans in red towards us for "only winning sh*t cups" in the late nineties. The home crowd cheering the fact that we would not win the league several seasons ago at the Emirates while forgetting the fact that their side could not win any trophies either. The general smugness of that football club is like that of a footballer's wife - one that thinks it is "TFTF" - Too Fit To F*ck while not ever being able to acknowledge its own faults. Such as jeering any club that has a smaller attendance than its own while at the same time forgetting that its own new stadium has the atmosphere of an abandoned warehouse. Even today, one Arsenal fan had the cheek to shout, "south London is sh*t" outside Fulham Broadway while forgetting that its own club's origins lie south of the river. Let's put all the hatred aside and concentrate on the game. Unlike their football club and their fans we at least can acknowledge good play. In the first half there was no doubt that they posed a huge threat up front. The speed and skill of their attackers made for uncomfortable viewing and had it not been for the experience and positional play of our defence we could have been in serious trouble on several occasions. But they did not take advantage of opportunities they had once in our third of the field. If Schurrle had not made wrong decisions with virtually every key pass he attempted then we, too could have been in a more promising position at the end of the first half. The simmering in my blood since the visiting fans caused the game's kick-off to be delayed by letting off flares outside the ground (which worked in my favour as I barely made it to the ground on time) was increased to boiling point when Wenger ran towards Mourinho following an admittedly late challenge on Sanchez by Cahill. It is not often that one shouts thing in ire from the West Upper or even stands up unless Chelsea have scored - but in this case I had absolutely no shame in calling for our manager to nut his opponent. It then dawned on me how much this fixture meant to me. And when we won a penalty which Hazard took so coolly in his best game for a long time an element of calm descended on my psyche. We never felt safe being only up by a single goal but the second half was different. Chelsea tightened up their midfield and once twenty minutes was left on the clock Mourinho changed tactics so that we played in a more counter-attacking manner. And then came the piece de resistance. Having gone through a period following a poor corner taken in front of berating Arsenal fans, Fabregas showed his true quality and placed a through-ball for Costa to score my favourite kind of striker's goal. A run through the middle of the defence beating the offside trap and then an exquisite lob over the oncoming 'keeper to seal the victory. There were light tears in my eyes as yet again Diego cemented my view that he is the missing piece in the Chelsea jigsaw that has not fulfilled its potential over the last few seasons despite still winning so much. Complete football it was not as this was an Arsenal side that was up for this match and certainly in the first half performed like title rivals. And yet we still won 2-0 by taking the chances that were presented to us. That is the difference against the better opposition this season. And to have Cech as a sub for Courtois! What a game and what a fantastic feeling to beat that team in red. Come on Chelsea! Lisbon is a familiar place for me but unlike the last time it was a sober visit. The previous occasion was for an international game where Poland somehow held Portugal to a 2-2 draw at the Estadio da Luz. It was a hazy evening at best that time so this was going to be one which involved more culture and how best to carry this out than in the usual manner - by trying to visit as many local stadia in one city as possible during the space of my 30-hour stay. The plan was set up virtually to the minute... The excellent Wikipedia gave me a list of teams in the top several divisions and then using googlemaps the distances from my hotel in the middle of the city centre to each club's stadium was calculated. This was eventually whittled down to picking those within a five-mile radius and then in which order they should be visited in. 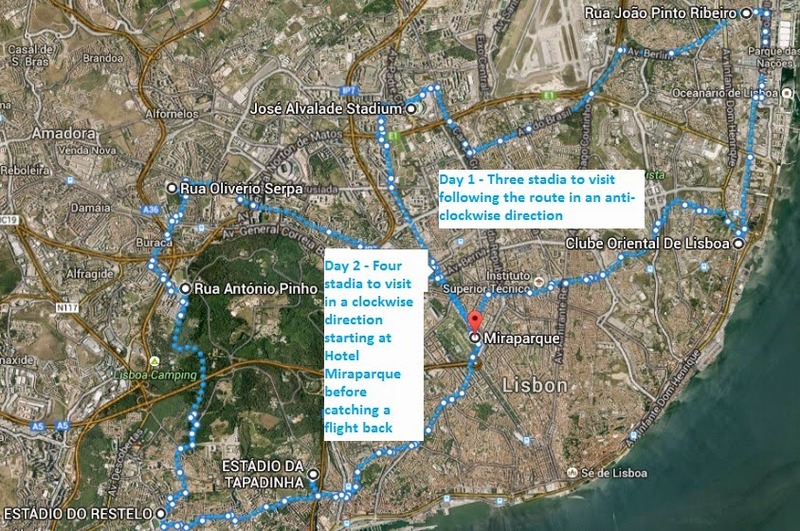 The route created a beautiful "butterfly" effect with the right-wing to be visited on Tuesday - eventually ending at Sporting Club de Portugal's stadium - and the left-wing to be followed on the Wednesday. The day of the match started in a disappointing manner with a large cardboard cutout of the Manchester United team greeting me at Heathrow. The whole of my tour was to be carried out using public transport and the bus from the airport to the hotel also passed a strange shop - one that only sold Porto merchandise... in Lisbon! Googemaps had provided me with the exact directions from hotel to stadia by train, metro, bus or tram and the first visit was to Clube Oriental de Lisboa based in the South-Eastern part of Lisbon. It was not an easy place to find - hidden amongst some apartment blocks and on top of one of the numerous steep hills found in the country's capital. At first there was disappointment as it appeared there was no way of accessing the Campo Engenheiro Carlos Salema despite doing a full stroll around its circumference. I was given a very friendly welcome. Having been allowed to take photographs of the ground there came the added bonus that sometimes you are given without asking - a full tour of the changing rooms, weights room and an extra special gift - an original pair of player's shorts. There were some fantastic little bits and pieces. An axe lying on the physio's treatment table which apparently is used as a symbol to remind people when wages need to be paid. The doctor's room that looked like it had appeared from an hastily made scene from Dr Kildare. A stadium that like many lower league clubs in Portugal resembles the old West Stand benches all the way round. A sweet team bus adorned in the club's crest and colours. The whole feel around the area is one of community. A school is a stone's throw away as is a hospital for the seriously disadvantaged. As with Porto, you do not get the impression that people live a life of luxury in Portugal but by the same token you do not seem to see much unhappiness either. Graffiti is communist rather than right-wing of nature. Locals are kind to help with one even escorting me to the local train station onto my next stop as I sweated through the beautifully warm weather. So onto Clube Desportivo Olivais e Moscavide. This is a club that has been down in the doldrums and although the stadium appears to still exist it has fallen into serious disrepair. The pitch is more unkempt than Brian Blessed's beard with a man asleep at the table of the bar/restaurant outside the stadium and men resembling drug dealers loitering in the vicinity. A guy on top of one of the floodlights kept shouting at me but when approached seemed to quieten down. Supporter's banners ("Mosca Knights") hung behind the back of the club's offices and it was a sad state of affairs to witness. The scoreboard was attached to a barn made of corrigated iron behind which a workman's garage was hidden away from view. I made a quick exit to the metro and onto my third and final destination of the day. Sporting Clube de Portugal based at the Estadio Jose Alvalade. It was a match which Chelsea needed to win in order to relax for the remaining stages of the group following the disappointing home draw against Schalke. And what a performance to witness. Some breathtaking football and as against Bolton the worry was not about not playing attacking football - it was missing so many chances to absolutely annihilate the home team. Four, clear one-on-ones and again Schurrle spurning an easy tap-in. Nevertheless, three points in the bag with the only blights being an annoying, green laser being shone in the eyes of our players - let's hope this is cracked down upon as soon as possible. Smoking was allowed which annoyed too. The stadium itself is well-designed and -situated but one of those where seats are multi-coloured in order to disguise emptiness when the ground is not full. It was easy to get to although it did make me chuckle to hear some home support sing, "Super Frankie Lampard" to us in the Metro after the match as if to wind us up - as if! It would be like us singing Ronaldo's name back to them... very odd indeed. Our support sang throughout and although there is no doubt that half were the worse for wear it adding to a cracking atmosphere.